Triple Canopy is pleased to announce Anjuli Raza Kolb, Jaffer Kolb, and Kameelah Janan Rasheed as the recipients of our sixth annual call for proposals, this year held in partnership with NYPL Labs. Engaging materials in The New York Public Library’s holdings both critically and imaginatively, as documents of past events and practices as well as bases for new creative work, these projects enact new modes of reading and writing history. Over the next year, recipients will work closely with editors toward the creative and technical realization of their projects, which may be published in a variety of formats, ranging from public performance to print pamphlet to hand-coded Web work. To this end, recipients receive six months of access to one of the research study rooms at the Stephen A. Schwarzman Building; access to reference librarians and the NYPL Labs team for one-on-one consultations; and an honorarium of $2,000 from Triple Canopy. Their projects will be published in Triple Canopy's online magazine and also represented through public programs at the New York Public Library, as part of NYPL Labs’ ongoing effort to engage digital practitioners in new forms of knowledge creation and dissemination. Proposals are reviewed by Triple Canopy year-round via our online submission form. We thank everyone who applied to the call and congratulate this year’s recipients! Victor Prevost, Men Standing on Willowdell Arch, 1862. Courtesy of The New York Public Library. Anjuli Raza Kolb and Jaffer Kolb are siblings working at the intersection of visual and scholarly practice. Anjuli is a professor of English and comparative literature at Williams College and Jaffer is a designer and lecturer at Princeton University’s School of Architecture. For their Triple Canopy commission, the Kolbs will explore the social and architectural history of the Central Park Ramble. 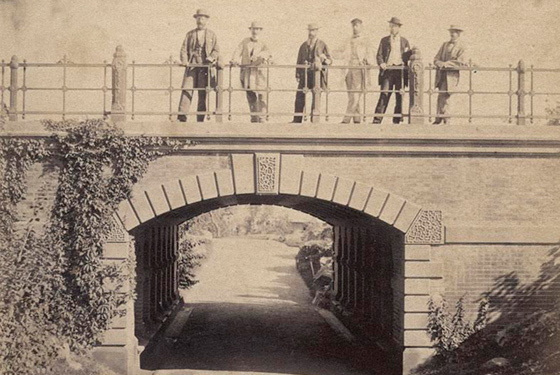 Frederick Law Olmsted and Calvert Vaux, along with master gardener Ignaz Anton Pilát, designed the thirty-eight-acre Ramble to bring the “mysterious illusion of lush, tropical vegetation” into an otherwise highly rational park. The perfect combination of wildness and density, invisibility and navigability, the Ramble has served as one of the city’s most significant wilds, a space for orgiastic reverie, for community and solidarity, and for refuge and love during the darkest days of the AIDS crisis. The Kolbs’s research will draw upon the library’s Pilát papers and the Gay Activists Alliance records. 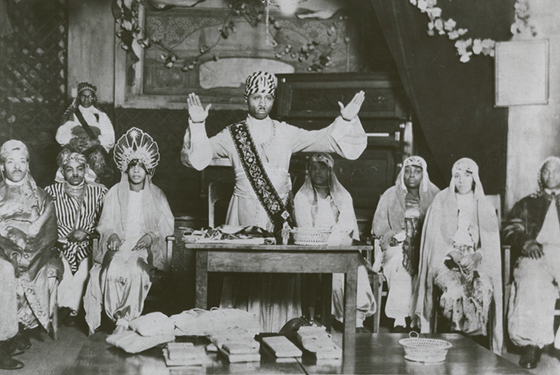 Prophet Noble Drew Ali (standing center) and temple members, at religious service of the Moorish Science Temple of America, circa late 1920s. Courtesy of The New York Public Library. Kameelah Janan Rasheed is an artist-archivist whose work has been exhibited at the Studio Museum in Harlem, the Queens Museum, the Bronx Museum, the Schomburg Center for Research in Black Culture, and the Weeksville Heritage Center, among other venues. Rasheed’s project focuses on printed matter, sermons, and religious iconography produced in the late nineteenth and early twentieth centuries within black religious movements in the United States. She will explore how self-anointed black prophets created and sustained post-slavery communities, inspiring a sense of belonging on the part of followers. Her research will involve sermons, song lyrics, proselytizing materials, photographs, FBI investigation files, and ephemera related to the Church of God and Saints of Christ, the Moorish Science Temple of America, and the International Peace Mission, all housed at the New York Public Library’s Schomberg Center. Rasheed will write a sermon for the eve of the twenty-second century that draws on these documents, as well as an essay that includes annotated archival materials and video interviews with contemporary adherents of these movements. NYPL Labs is an interdisciplinary team working to reformat and reposition the Library’s knowledge for the Internet age. Labs combines core digital library operations (digitization, metadata, online access) with a publicly engaged tech, design, and outreach team focused on enabling new uses of collections and data, collaborating with users on the creation of digital resources, and applying new technologies to library problem-solving.